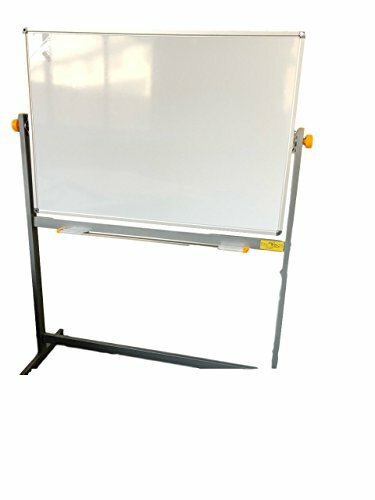 This is a mobile whiteboard, two-faced, reversible - 48" by 34". DOUBLE SIDED HIGH QUALITY LAMINATION and MAGNETIC FEATURE: We use the best laminating process for our double sided large dry erase board to deliver a no ghosting or staining whiteboard that you can easily flip and set with our sturdy side wheels. With our magnetic dry erase whiteboard you can easily hold erasers,markers or even hold papers without slipping. EASY TO ASSEMBLY: Our whiteboard on wheels is made of high grade materials with easy to follow instructions for an under 30 mins construction. With a complet set of spare screws and tools for assembly you can have your standing whiteboard in no time. HANGING OR STANDING: You can it as a stand up white board that you can easily roll in the office or as a hanging dry erase board for the wall. The wall whiteboard can be fixed with one screw in each corners in the ready made holes. FLEXIBLE MULTI-USE: Our portable whiteboard with stand can work out great as a lacrosse, soccer, baseball or just an office or cubicle dry erase white board. It can be great for homeschooling being a great dry erase white board for kids. With our 4 stop system casters you can fix the whiteboard stand with no slipping. SAFE SHIPPING and LIFETIME WARRANTY: We ship all our white boards with extra padding to avoid all those bumps and waves you hear about with other brands. We are so confident that we offer a 90 days MONEY BACK GUARANTEED! If you have any questions about this product by Phobos Materials, contact us by completing and submitting the form below. If you are looking for a specif part number, please include it with your message.